Last week an Israeli helicopter gunship targeted Hizbullah outposts in Syria southwest of Damascus, near the front with the rebel Support Front (Syria al-Qaeda), which controls the Golan Heights on the Syrian side. These outposts were not in fact bordering Israel or likely aimed at Israel, but rather were intended to push back al-Qaeda from the outskirts of Damascus and ultimately to dislodge it from the Golan. Therefore, it is likely that the Israeli strike was merely opportunistic— Tel Aviv received intelligence that commanders who had humiliated them in 2006 were present and vulnerable, so they struck. Ooops. Along with high ranking Hizbullah personnel, they killed a general in the Iranian Revolutionary Guards Corps, who was advising Syria and Hizbullah on how to roll back al-Qaeda in the Golan. Lebanon is a country of some 4 million and there are probably only 1.5 million Shiites there, and not all of them back Hizbullah. So it isn’t actually all that formidable for Israel (a country of over 7 million). But Iran is a country of 77 million. I think it is entirely possible that if the Israelis had known they risked killing an IRGC commander in this strike, they might not have done it. As it was, the Israelis uncharacteristically conveyed to Iran a statement that they hadn’t intended to assassinate Gen. Mohammad Ali Allahdad. It wasn’t exactly an apology, but it was clearly intended to dial back the resulting tensions. Nevertheless, Iran sent a message through the US to Israel that the latter had crossed a red line in killing Allahdad, and that Iran would find a way to retaliate. Hizbullah also vowed to retaliate, and did so on Wednesday, killing two Israeli soldiers and wounding seven in the disputed Shebaa Farms strip, which is occupied by Israel but claimed by Lebanon. Since Hizbullah hit a military convoy, this was not technically an act of terrorism but rather an act of war or resistance. And since they targeted Israeli soldiers in an occupied territory that Israel has illegally annexed, Hizbullah had not violated international law as most countries would understand it. Israel responded yet again, shelling Shiite villages along the Lebanon-Israel border. 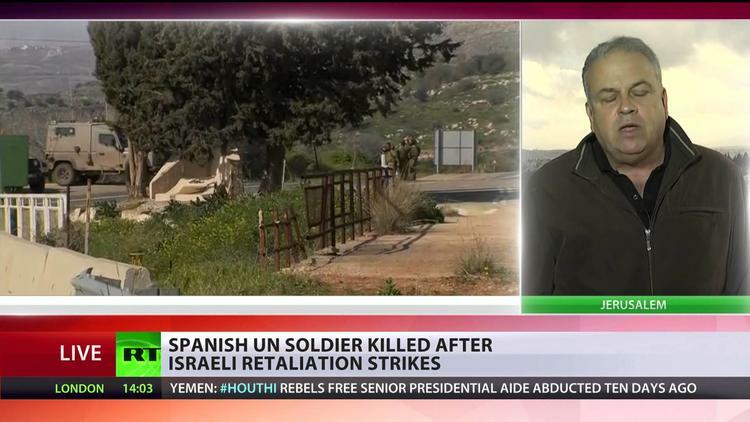 They killed a Spanish peacekeeping soldier, for which Spain angrily blamed Israel. Ironically, in this case, Israel and not Hizbullah was guilty of a war crime insofar as it directed arbitrary fire at civilian, non-combatant villages. If they killed a Spaniard they likely killed other innocents. Israeli Prime Minister Binyamin Netanyahu warned that the Lebanese should take a look at how he had reduced Gaza to rubble. Quite apart from the war of words and a few shells between Israel and Hizbullah, it seems to me that Netanyahu just announced that he deliberately reduced Gaza to rubble and killed 2000 mostly non-combantants as punishment for its having defied him. If so, that would be a war crime. But Netanyahu’s likely was an empty threat for the moment. With elections coming up, it isn’t the right time for Netanyahu to launch a new Lebanon war. And the fact is that Israel didn’t do very well in the 2006 war with Hizbullah, despite its overwhelming military superiority. As for Hizbullah, its leader Hasan Nasrallah probably felt that he had no choice but to restore face by striking back at an Israeli target. But Hizbullah is bogged down in Syria defending the regime of Bashar al-Assad, and is in no position to fight both Syrian al-Qaeda offshoots and the Israeli army. Even Israel agrees that this is likely the case. So likely the two sides will gradually wind down the confrontation and concentrate on bigger and more important enemies. At least for now.